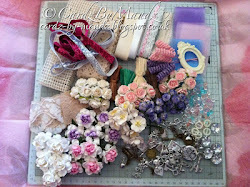 This time 3 years ago Nikky Hall started the Polkadoodles challenge blog. flowers and other embellies are from my stash..
Hi Shell, this is gorgeous and very pretty!!! hope the sun is shinning on you today!! Gorgeous card shell and I just love the frame effect which looks fabulous. Beautiful card! Thanks for joining us this week with your beautiful flower creation. Gorgeous Gorgeous. The colors are wonderful. Thanks for joining us at OSAAT, and hope to see you back. Love the pink a and green combination of colours Shell. Really pretty embellishments too!